Men, and their partners who want them to practice a good skin care routine, might be interested in the Dove for Men line of products. These target everything from head to toe. While some guys are perfectly fine lathering up with any brand of bar soap and don't know face cream from body lotion, other men look for specific products made just for them. They don't want to use the floral and sweet-scented products their girlfriends or wives use - they want something designed for men. There's nothing wrong with men who take care of their bodies and who want to look good. In recent years, skin care and cosmetics companies have developed lines specific to guys. This is great news for women who don't want to share their facial cleansers! Now guys have body and face washes that target their needs without worrying that they'll come out of the bathroom smelling like roses. Clean Comfort Body and Face Wash: For the man who has dry skin, this cleanser will get him clean and moisturized. The MICROMOISTURE technology kicks in when he lathers up with this easy and clean-rinsing wash. Deep Clean Body and Face Wash: The purifying grains in this product will give a man a deeper clean, perfect for the guy who feels his skin needs extra cleansing. If a man suffers from oily skin, he may find this wash helpful in ridding his face of extra oils. Extra Fresh Body and Face Wash: When you want to feel extra fresh, this wash will leave your skin tingling. Cooling agents will feel great in a hot shower, so you may want to give this one a try on especially hot days or after a vigorous workout. Deep Clean and Extra Clean Body and Face Bars: These cleansers are the same as the washes above, but in bar form. They contain the ¼ moisturizing cream that Dove bars are known for. Active Clean Dual Sided Shower Tool: This special washing tool will help men get a refreshing deep clean with any of the cleansers available. One side is made of mesh, similar to body sponges, while the other side is a scrubber for serious cleaning. Its easy-grip design makes it ideal for use in the shower or bath. For men who have never exfoliated their skin before, they may be surprised to see the difference regular sloughing makes through the use of this dual-sided tool. Men and women will find it convenient to locate Dove products on store shelves, whether for women's or men's skin care needs. If you're having trouble finding the brand locally, Amazon.com carries it as well. Maybe your man doesn't care what he uses on his face and body, but you feel a little pampering will help him. 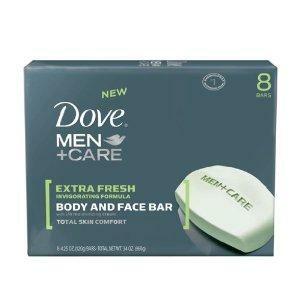 The Dove line of products for men are an affordable option that he might appreciate. Leave it in the shower or on the side of the tub - chances are, he'll use it. Then you won't have to worry about him using your special body wash and he won't have to worry that he'll smell too much like a woman.